With L. R. Baggs Anthem duel-source electronics, it comes ready to rock. Specs include: Super Jumbo body size; maple back, sides, and neck; radiused AAA-grade Sitka spruce top; hand-sprayed, high-gloss ebony nitrocellulose finish; rosewood fretboard and mustache bridge; bound fretboard and headstock; gold Grover Imperial tuning machines; round neck profile; bone nut with 1.725″ width; approx. 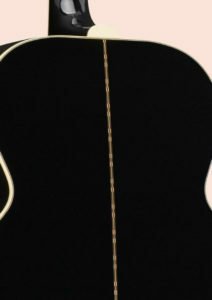 2-3/16″ string spacing; Tusq saddle to go with the Baggs Anthem undersaddle pickup. 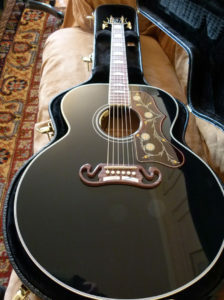 This SJ-200 Ebony offers Gibson’s historic Super Jumbo size with the swanky 200 styling, in a special Ebony finish, similar to that seen on their electric guitars. 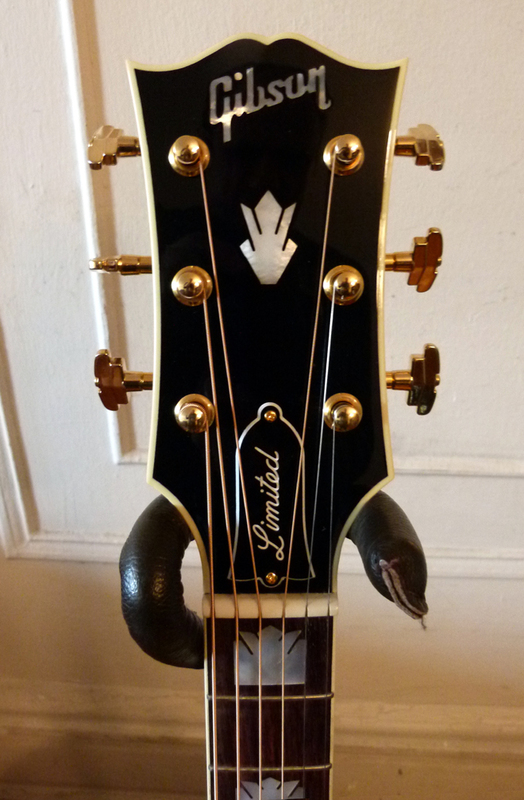 In fact, this Limited Edition is an acoustic-electric guitar, stage-ready with an on-board L.R. Baggs Anthem duel-source pick-up system, which combines an undersaddle pickup and microphone. I have wanted to feature a Gibson for a long while and chose their standard Super Jumbo 200, which sets quite a standard indeed. The one I ended up with happens to look extra cool thanks to its limited edition high-gloss black finish. While the world’s best-loved acoustic guitars come in many shapes and sizes, few are as iconic as the Gibson SJ-200, and nothing else sounds quite like one. The immense sound chamber within that Super Jumbo body provides heft to the bottom end and ample volume across the entire tonal spectrum. With American maple used for the two-piece back and ridged sides, the fundamental voice is distinct and straight forward. And the radiused soundboard is made of solid Sitka spruce, with the power and dynamic personality to give the notes of each string considerable substance without sacrificing definition, whether the strings are played with vigor or caressed with a lighter touch. Hot hide glue is used to attach the two-piece maple neck via a traditional dovetail neck joint and solid-wood neck block, allowing maximized energy exchange between the body and the neck, while getting the most out of the Sitka top that gives a woody warmth to the wound strings and helps realize the clear singing notes from the unwound treble strings with their violin-like purity. A large guitar to be sure, the SJ-200 is quite comfortable to play even when seated, as the waist is positioned so most of the big, round lower bout is off to one side. The 25.5” string scale does feel a bit longer than the other round-bouted Gibsons, but it also helps provide the string tension that will take full advantage of the potential energy in that wide spruce top. But it is still a very relaxed fretting experience. The shape of the neck is well-liked by many. It has a smooth curve to its C shaped profile, with rounded-off edges where the maple neck meets the ivoroid-bound rosewood fingerboard. And that fingerboard has a 1.725” width at nut and a 12-inch radius, meaning is not as flat as other makes of guitar that use a 16-inch radius, like Martin and Lowden. It all adds up to an impressive musical instrument of oft proven versatility. How else could it be the preferred guitar of fingerpicking bluesmen like the Reverend Gary Davis and Dave Van Ronk, and power chord rock legends like Noel Gallagher and Pete Townsend? When I play fingerpicking patterns on this particular SJ-200, the E and A strings have a good, solid thunk with a certain isolated warmth about them. There is no course raspiness heard at the edge of the tone, and that translucent presence emanating from each string stays focused right at the fundamental note, like a surrounding aura connected to it. The reflection from the maple sound chamber is immediate and serves only to increase the size of that bassy thunk. That same transparent yet woody warmth goes right up through the wound strings, with the midrange notes having less plumpness but the same focused report, which ends up being more of a pop than a thunk. Each note from the D and G strings sounds strong and steady, and stays that way, while any sympathetics they trigger in the bass or treble appear quickly and withdraw, without welling up to the point they get in the way of the fundamentals. The quickness of voice is one of the hallmarks of the Gibson sound, and with this big, maple Super Jumbo, each note reports fully formed and with immediacy. It is like the notes spontaneously come into existence in mid-air at the height of their volume and strength, and instantly drop down into the well of decay, one after the other after the other, heard clearly as they recede yet stepping out of the way of the next fully-formed note. The unwound trebles, on the other hand, are quite different in their silvery chime and precise purity. Here the resonance is more prevalent and reflective from within that deep sound chamber, and it makes the unwound fundamentals seem like they are hovering out in open space. As they practically twinkle when played lightly, like Christmas tree tinsel brightening up the thicker, woody trunk beneath. But that cavern grows shallower beneath the successive midrange strings, each a little fatter in its roundness, and in how much its fundamental note sits down into that sonic cellar. The G and D string are the most buoyant, with the most staying power when first played, and having the longest sustain as the bass and treble fade away. When strummed briskly, the notes gather together and pop out as a unified chord that is centered at the midrange, but with ricochets of high end reflection, almost like glints off of chrome. And when strummed with even more energy the voice compresses at the midrange into those fleeting flick-a-flicks that always bring to mind the crescendo endings heard on early Bob Dylan recordings. The maple SJ-200’s strong fundamental and uncluttered resonance with its clean decay have much to do with why this model is so often seen on the concert stage. It plays its acoustic guitar part with distinction and clarity, without encroaching into the broader harmonic tapestry of the supporting instruments, like the bass and keyboards, etc. That, and the fact it looks like it belongs in the hands of the star in the spotlight. Yeah. Despite the deep dark, hand-sprayed ebony shade to the back, sides, and neck, this limited edition still has the expressive, bright yet woody tone of a classic SJ-200. At least the ones they make these days. Depending upon the year of production an SJ-200 could be a different guitar from those produced in some other era, as the specifications were adjusted over the eight decades since it first came off the drawing board in 1937. Some specs took hold, while others have come and gone, like the heavier bracing of the 1960s version, and the Brazilian rosewood back and sides used to construct the earliest examples. But the features that define this historic icon today are all there in this SJ-200 Ebony Limited, including the distinctive body size. The early twentieth century saw tremendous advancements in the development of the American acoustic guitar. What had been a small parlor instrument during the American Civil War became the basis for experimental designs, as innovative new models grew in size and diversity in the following decades, right along with the fledgling forms of modern music emerging at that time. The guitar had an enormous influence upon the shaping of modern Jazz, Blues, Folk, and Country & Western music, and in turn the Rock n Roll that came from them. And it was the input and preference of the players from all such musical genres that helped shape the guitars themselves. The SJ-200 appeared on the scene right in the heart of that extraordinary musical evolution. The original archtop guitar designs invented by Orville Gibson, and later perfected by the immortal Lloyd Loar, provided a versatile, more-resonant alternative to the banjo, which had been the preferred steel-string rhythm instrument in early dance bands and jazz orchestras. Gibson’s later flattop acoustic guitars arrived in time to be embraced by the rising musical stars whose popularity spread via the revolutionary new sensation of radio. 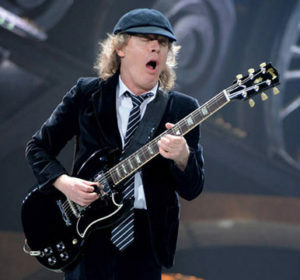 These included jazz singer Nick Lucas, and multi-instrumentalist Roy Smeck, who each endorsed and played Gibson signature models. The original Nick Lucas Special appeared in 1926. To make it, Gibson used the silhouette of their L1 Archtop, with its feminine shaped waist and rounded lower bout with a 13.5″ width. But the body was fully 4.5” at its deepest point, creating a larger sound chamber than the flattop L-size instruments Gibson debuted that same year. The Roy Smeck models debuted in 1934 as 12-fret Hawaiian-style instruments with yet another, even larger body size. 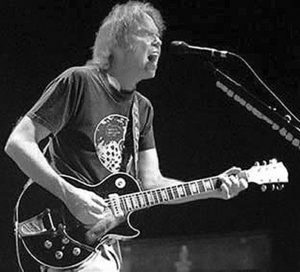 Gibson used it for their brand new 14-fret design that they called the Jumbo, as its slope-shouldered shape, wider waist, and lower bout with a 16″ width and 4.5” depth dwarfed their previous flattop designs. The large, 14-fret Gibsons continued to evolve, as the Advanced Jumbo appeared in 1935, with lighter bracing and other subtle changes. And in 1937 they combined the depth of the Jumbo design with the tighter waist and rounded lower bout of their L models, resulting in yet another new flattop model with an even wider 17” lower bout, named the Super Jumbo. It went on sale in 1938, and the next year it was renamed the Super Jumbo 200. The new name reflected its princely price of $200, while connecting it with their popular Super 400 archtop guitar, and set it apart from other jumbos at the pinnacle of their flattop guitar line. The most significant alterations to follow included the change from rosewood to maple back and sides in 1947, and an increase in depth to 4.75” in 1948. The name was simplified to J-200 shortly thereafter, but Gibson never stopped referring to it as the Super Jumbo, and these days the S has returned to official designation. By 1950, the appointments and materials were well established, and the big blonde guitar had become a bona fide star. A great many were made with a sunburst finish on the top, and even the back and sides. Others were finished in various rich solid colors. But none had quite the same mystique as the SJ-200s made in black. The on-board electronics are not the only thing that will draw touring musicians to this SJ-200 Ebony Limited. 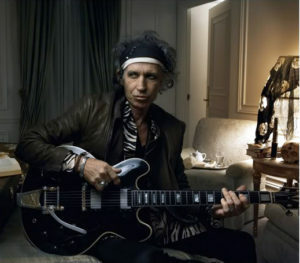 The official Gibson marketing language declares it “dressed for rock n roll,” and there are many professional guitarists known for their black electric Gibsons, who also play acoustic Gibsons. This Ebony LE is a black stallion of a guitar that would fit right into the stables of many rock stars. 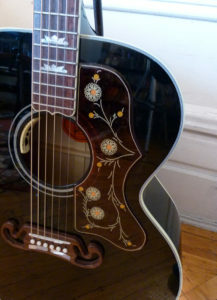 Unplugged, it remains the same versatile SJ-200 that has been right at home in the hands of country music songbirds like Emmy Lou Harris, folkie troubadours like John Hyatt and Bob Dylan, and of course Elvis Presley, who played a blonde SJ-200 in his youth and a black one later on, which looked similar to this Ebony LE. It just makes sense that “the king” would play the “King of the Flattops.” Actually, that title was invented by Gibson’s modern marketing department, but the majestic looks that inspired it have been there all along. This regal and rotund Henry the VIII of a guitar has large mother-of-pearl crowns inlaid on the rosewood fingerboard, which is bound in ivoroid, as is the large decorative peghead, with its jet black faceplate, double crown inlay, and bound truss rod cover with its white “Limited” in the same flowing script as the large Gibson logo. And all of it is ornamented by the gold buttons of the Grover Imperial tuning machines, with their smooth 16:1 gear ratio. 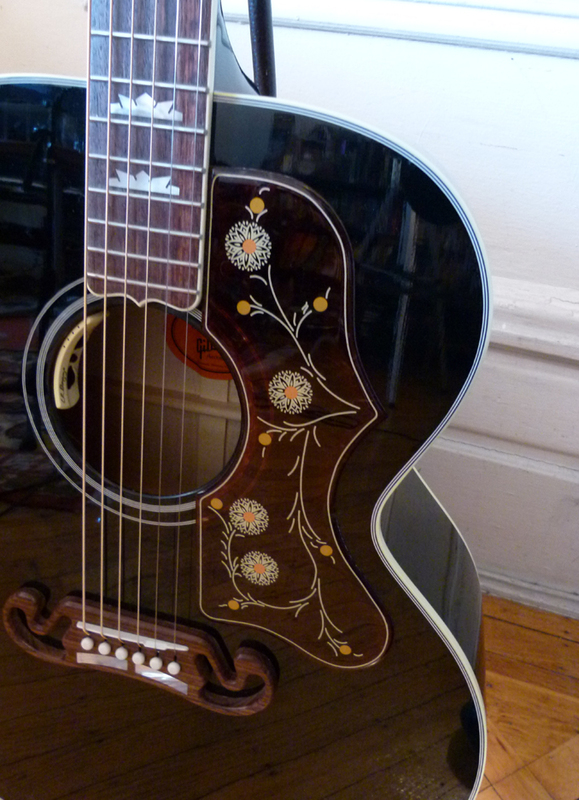 From the fret markers and tuners to the multi-ply binding on the back and top, to the grandiose mustache bridge and stylized vine and flowers inlay on the extra-large ornate pickguard, the overall aesthetic is art deco in feel, which harks back to the pre-war era when the SJ-200 first ascended to Gibson’s acoustic guitar throne. While one can see the family resemblance to the L-5 and Super 400 archtops, nothing else looks quite like it. Gibson’s Super Jumbo 200 is one of the few truly iconic acoustic guitars ever produced, and among the most-recognizable, as is the tone it puts out. The bass is big but not boomy. The trebles are clear and ringing. The midrange notes are distinct but have a woody warmth to them. It shares tonal properties with Gibson’s classic maple archtop guitars, with its immediate report of unfettered fundamental notes, and the unified yet individual signatures of each string during sweeping strums, and the gathered punch during chunk-a-chunk rhythmic chording. But it has its own personality, with that resonant, reflective shimmer to the high end and a fatter, warmer presence in the bass and mids no archtop can match. In other words, the SJ-200 is a classic. And this jet black version is pretty darn classy. Is it any wonder the SJ-200 ends up in so many hands on thousands of concert stages? Well, this particular version won’t, as it is after all a limited edition. So if you love the looks and would love to have a large and handsome maple guitar that comes with a duel source pick-up installed, you may want to seek one out sooner rather than later. List Price: $4,649 – ask your Gibson dealer for their best price.